Nearly three years ago, we received a bandcamp link from a two-man instrumental act called Temple. Self-identified in their description as "instrumental black metal," I was immediately intrigued. While this seemed like a descriptor that would have surely been placed on the metal blogoshpere's carousel of sub-genres already, I couldn't quite place a band that completely fit that label. Thankfully for my ears, I decided to check out their debut album On The Steps of the Temple (reviewed by Durf here). In the wake of the positive response to the album, the band got picked up by Prosthetic Records, changed their name ever so slightly to Tempel, and have now released a second offering for us to enjoy. 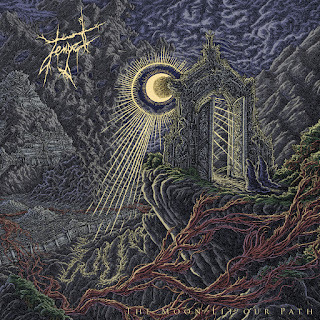 Improving upon the formula from their first album, The Moon Lit Our Path showcases Tempel taking the trademarks of black metal and weaving them into atmospheric elements, soaring guitar solos, anthemic riffs, and unrelenting beats. What results is a soundscape that is foreboding, serene, and full of heavy energy all at the same time. The opening track "Carvings in the Door" sets the tone of the album: deep and menacing guitar tones ominously echo in the ether until a barrage of blasting drums and chugging guitars picks you up and places you into one of the many walls of sound to come. Also representative of the album as a whole, the opening track is comprised of noticeably distinct sections, the transitions between these sections, however, is seamless and helps an eight minute song seem like a two minute one. The second track, the title track, continues in this fashion but transitions more into the atmospheric sensibilities that Tempel has greatly improved upon since their debut album. Slowly developing guitar lines reverberate alongside catchy and steadfast guitar rhythms that create a great sense of anticipation for what lies ahead. While the first two tracks are undoubtedly solid, the last three are where the biggest payoffs are. "Descending Into the Labyrinth" takes the strengths of the first two tracks and builds upon them. Acoustic guitar passages and intricate guitar solos are brought into the mix, easing the listener from melody into heaviness and even sometimes blurring the lines between the two. "Tomb of the Ancients" follows the same formula but focuses more on the power of the riff, more so to hold your attention until the album's ultimate peak, closing track "Dawn Breaks Over the Ruins". The track bookends The Moon Lit Our Path, resulting in the perfect amalgam of the albums nuances. Out the door is the lo-fi black-metal shredding of old, as production value adds its own layer of warmth to the track. Combined with guitar leads thick with reverb and storming drums, the result is both devastating and rewarding. The last half of the track features a build up of epic proportions that I would be envious of anyone hearing for the first time. Although I try to stay as objective as I can when reviewing an album, there really isn't any major issues I can pick out with The Moon Lit Our Path. The biggest problem I had with their debut album was that the tracks felt isolated musings; but this is no longer the case with this new album. Sure, it may not reinvent the wheel or anything, but there's always something to be said for albums that take familiar styles and give them their own small twists. 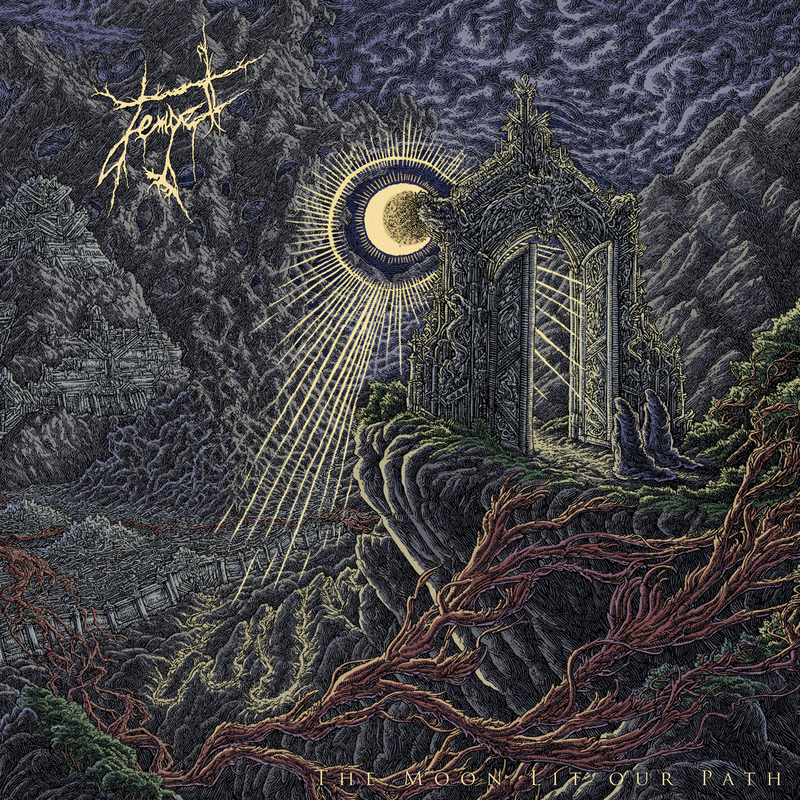 The Moon Lit Our Path is not just a fantastic album, it's a testament to how much Tempel has improved as a band in the past couple of years. It's a collection of tracks that should rather be heard as a singular flowing piece of music that is best enjoyed from start to finish. If the idea of mixing instrumental black metal with atmospheric and anthemic qualities is at all appealing to you, you would be doing yourself a major disservice by not checking this album out.